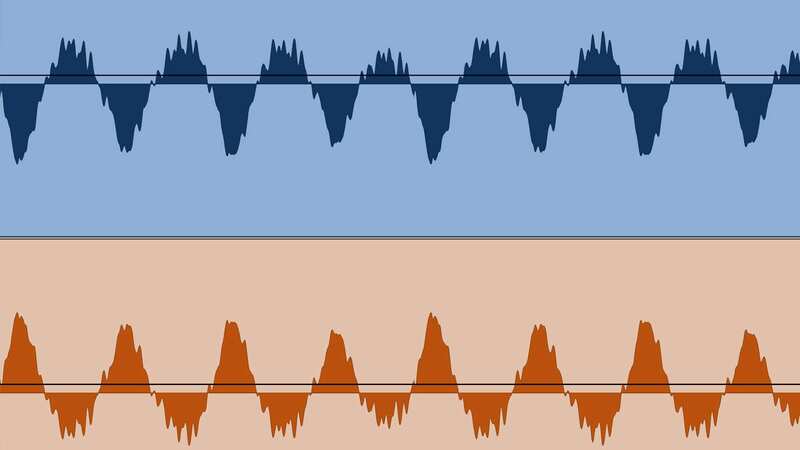 Mixers must navigate a fine line between creating wide stereo mixes and ones that are phase coherent and will hold up when summed to mono. A mono-compatible mix isn’t as important as it once was, but neither is it something you can ignore. There are still plenty of scenarios in which your music may be heard in mono. For example, club sound systems are sometimes mono; most mobile phones have mono speakers as do some laptops and Bluetooth speakers; stores and other commercial spaces sometimes have mono playback systems; and that’s just a partial list. You can’t control where your music will be heard, and by creating a mix that doesn’t translate well to mono, you’re taking a risk. Having phase problems is one of the biggest hurdles for mono compatibility. In this article we’ll look at what causes them and discuss preventative remedies. The pan pot is one of the most powerful tools available to a mix engineer. The ability to assign each element to a place in the left-to-right spectrum makes it easier to fulfill the mixer’s mission of making sure each part can be clearly heard. The flip side of that is when you sum your mix to mono, suddenly the width disappears, and things may sound a bit cluttered and indistinct. If mono compatibility is important for your project, you might have to work to moderate your panning and use EQ and other methods to carve out space for each of the elements. Outright phase cancellation is another issue entirely. You’ll know you’ve got it if instruments drop significantly in level or lose body when you hit the mono switch. Problems with phase can even degrade the sound of your mix in stereo, though to a lesser degree. It’s best to diagnose and eliminate any phase problems as early as possible in the mixing process. One of the most common causes of phase problems comes from recordings of the same source made with two or more mics placed at different distances. 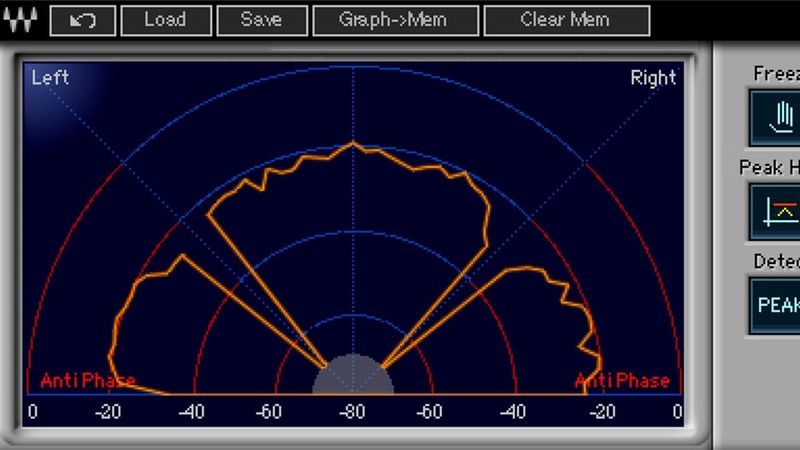 The distance variations cause the sound to arrive at the mics (and therefore get recorded) at slightly different times. When the tracks are summed to mono, they interfere with each other, causing sonic degradation (aka “destructive interference”). The worst-case scenario is a total cancellation of the audio if the two elements are 180-degrees out of phase (where the peaks of the waveforms are pointing in opposite directions at a given point in time) during mono playback. A more common result is comb filtering, which can cause tracks to drop in level and sound scooped, ‘phasey’ and weird. Multitrack drums are by far the most likely source of phase troubles, because they’re recorded with multiple mics at a variety of distances from the kit or each kit element. Stereo acoustic guitar or any instrument recorded with more than one mic is susceptible to phase problems, too. The timing differences between the mics can create phase problems when summed to mono. Another dicey area is a bass, guitar, or any instrument recorded with simultaneously through a DI and a mic. The sound going through the DI can arrive a different time than that of the mic. A similar problem is also possible with re-amped guitars that are mixed along with their original DI track. In addition to acoustical phase problems, electrical ones are also possible. If a connector on a piece of gear or cable used in the recording is wired backward, you could end up with signals that are 180-degrees out of phase. These tracks are 180-degrees out of phase. Notice how the peaks of one track align with the troughs of the other. When summed to mono, they’ll totally cancel each other out. The easiest way to check for phase problems is to sum your mix to mono. If you have a monitor controller or a mixing console, chances are it has a mono switch, which makes the process of summing easy. 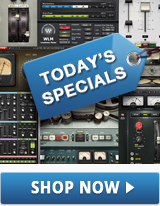 You can also use a plugin with a mono switch, like InPhase, inserted on your master buss. 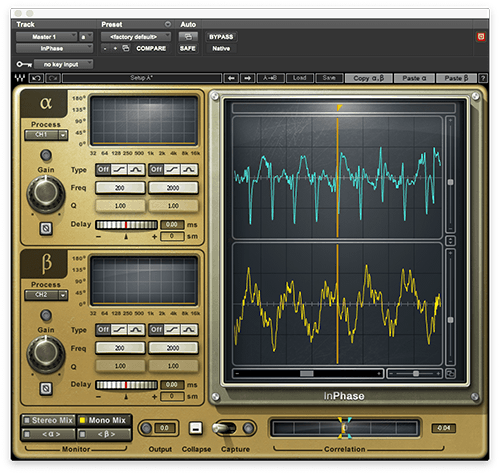 InPhase allows you to invert the phase, as well as make smaller timing adjustments between two separate tracks or within a stereo track. A handy way to check is to loop a section of your song, preferably during the chorus or another part where most or all the instruments are playing. Switch back and forth between stereo and mono as it plays back. Listen for elements dropping out entirely, getting lower in volume or experiencing a change in tone. 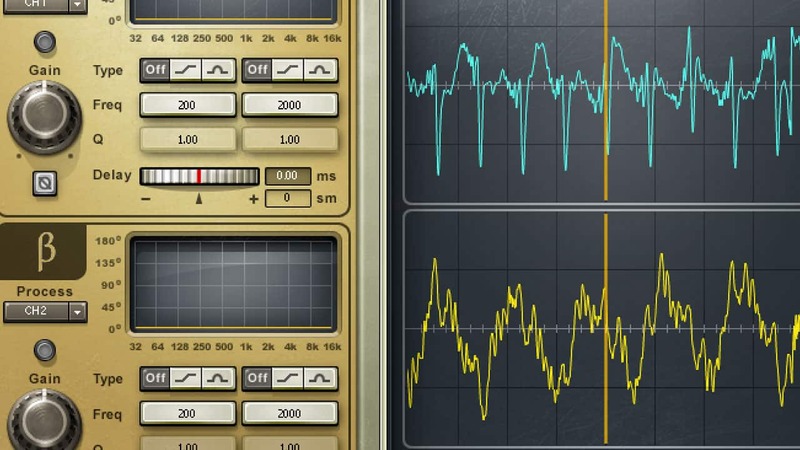 You can also diagnose phase problems through specialized metering plugins. The PAZ Position component of the PAZ Analyzer suite, features a meter that graphically shows phasing problems in your mix. The orange spikes to the sides of the Paz Position meter indicate that there are out-of-phase components in the signal. Dealing with phase troubles can be as easy as flipping the phase invert switch on one channel (you can use InPhase for this, or a channel strip like Scheps Omni Channel; also, many EQ plugins like Q10 feature a phase invert control per channel). Flipping one of the channels' polarity by 180-degrees will help to diagnose if there is or isn't some amount of phase cancellation, or may get you closer to a tone you like; however, perfectly aligning phase is usually more involved than a 180-degree flip. Insert an EQ or another plugin with a phase inversion switch and flip the phase on the kick track. If it sounds full and natural with it flipped, leave it that way. If not, flip it back. Next, do the same with the snare against the overheads, and then check each tom mic against the overheads. Remember though, that often problems are caused by tracks that are less than 180-degrees out of phase and require a subtler adjustment. Once the adjustments are made, you can 'commit' the tracks so that the phase fixes will be printed, and your phase-aligned tracks will be ready for the next stages of mixing. You can also adjust phase manually by sliding a track forward or backward in time. For example, if you have snare top and bottom mics that don’t sound right with each other, and flipping the phase doesn’t help, line them up one on top of another in your DAW and zoom way in to see their timing differences. Slide the later track to the left so that it starts at the same time as the earlier one. 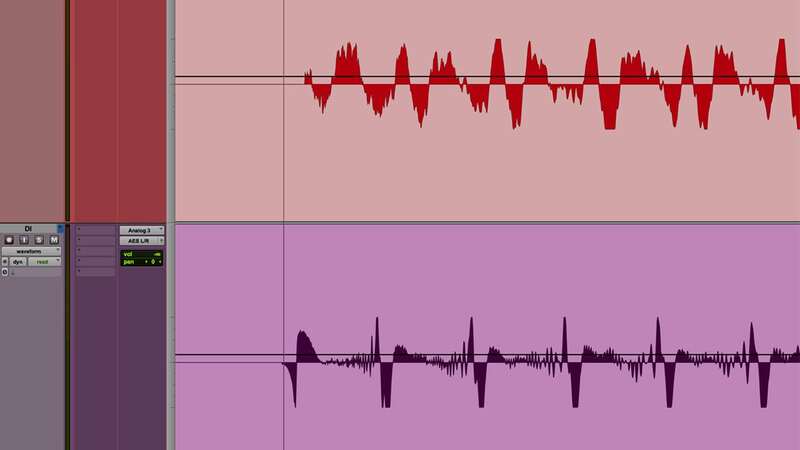 These tracks are from an acoustic guitar recorded with a mic (top) and direct (bottom). Notice the DI track is a slight bit earlier. Make sure to create a safety copy of your session before trying this technique, or at least duplicate the playlists (each take) for all your drum tracks. Once you start manually sliding tracks around, you run the risk of wrecking the timing of your drums, so you want to be able to revert back to where you started, if necessary. After you’ve eliminated, or significantly reduced phase problems from the recording process, you’re ready to move on with the rest of your mix. From that point forward, any decisions you make that impact the mix when summed to mono are creative ones that are under your control. One of those creative decisions you might make is to use a stereo imaging plugin. While they often sound really cool, be sure to check how they’re affecting your mix in mono. Many use phase to manipulate the image, and don’t sum well to mono. If you have stereo synth sounds in your mix that are panned fully left and right, pay attention to how they sound in mono, because they often incorporate phase manipulation to achieve their width. If the synth is being triggered by a MIDI track in your session, you could always try to adjust the patch, or find a different one that’s more phase coherent. The S1 Stereo Imager uses careful psychoacoustic processing to enhance a track's stereo width while retaining a high level of mono compatibility. Stereo synth basses can also present problems, because bass frequencies are more susceptible to phase problems. Mono bass sounds are a safer way to go and won’t drop in level when you sum your mix. In general, you're better off leaving instruments that live mainly in the low-frequency region, such as bass guitar or kick drum, in mono. If you’re having trouble getting phase issues under control, one radical technique is to start over and do your mix entirely in mono until late in the process. Do all your balancing, EQing and compressing with everything panned up the middle. Make the whole mix sound as good as possible before you touch a pan pot. It will force you to use other techniques, such as carving out space with EQ, to create room for your tracks. A mix that is done this way is more likely to hold up when later summed to mono. Even if you just try this technique once as an exercise, it’s worth doing. It might change the way you approach mixing. Whatever your workflow entails, having a grasp of phase issues and how to deal with them gives you a lot more control over the mixing process. You still might decide to create a mix that’s significantly different in stereo than mono, but if you do, it will be by choice. Want to learn about stereo width with mid-side processing? Get tips on how to open up your mix by working with mid-side plugins. Do you have any phase coherence tips that we missed? Let us know in the comments below.